These hand-painted tweezers are absolutely darling! In varying styles - let us choose one for you from available stock. 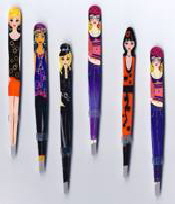 Very cute hand-painted nail files in varying styles - let us choose one for you from available stock. Hand-painted business card holder with notions and tools from your sewing basket. This is just gorgeous! Plush sweatshirt in teal, purple, and fuschia spool & bobbin with a silver needle and teal collar. 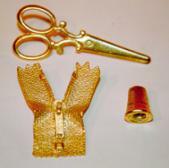 Chose from a miniature zipper (1 1/2" long), scissors or thimble, all in gold-tone for your lapel, hatband or to decorate a vest. 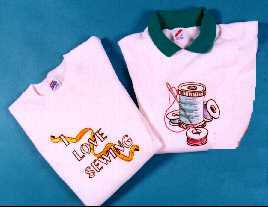 Tee features spools, quilt squares, sewing machine, scissors, pin cushion, thimbles, and a tape measure. 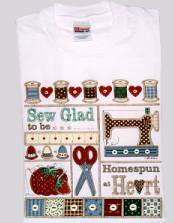 The words say it all - "Sew Glad to be Homespun at Heart!" Hand-painted key ring with scissors and spool of thread. These beautiful and ornate scissors are equally functional as they are pretty to look at. Sue Ellen includes a pincushion and pockets. Fabric hanger included. Sleek, moveable scissors are 3" long with a sculptured handle. Choose gold or pewter finish. Hand basket measure 7" wide and 4 1/2" deep x 6" tall (10 1/2" to the top of the handle). 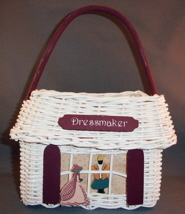 Basket depicts a dressmaker´s shop, complete with dress form, under a "Dressmaker" sign. Brushed silver finish dress form has a modern look. Comes complete with its own miniature gold tools (scissors, needle, thread, and thimble). Ten cards with matching envelopes on finely textured linen stock with coordinating ink color. Blank inside for your personal note.